A Journal of the Methods and Philosophy of Spirit-Manifestation, and its Uses to Mankind. Boston, MA. Editor: Alonzo E. Newton, editor and publisher. 1/1, April 7, 1855-3/39, December 26, 1857. 4 pp., 17 x 24. $2.00 a year. Alonzo Eliot Newton (1821-1889) was an early spiritualist and reformer who had been involved with S.B. Brittan in editing The Spiritual Telegraph. In later years he continued his reform activities by advocating "pre-natal culture" and eugenics and by serving as superintendent of the "industrial college" in the progressive/spiritualist community in Winslow, New Jersey. The prospectus the New-England Spiritualist which regularly ran in the journal says that it "has for its leading object the presentation before the community of the evidences, both ancient and modern, which go to establish the following propositions: I. That man has an organized spiritual nature, to which the physical body is but an outer garment. II. That he has a conscious individualized existence after the death of the physical body. III. That the disembodied can and do communicate sensibly with those still in the flesh. IV. That incalculable good may be derived from such communion, widely used. These propositions embrace what is popularly denominated Modern Spiritualism, and the questions involved in, and growing out of them, are becoming THE QUESTION OF THE AGE-than which none more interesting or important were ever raised among men." 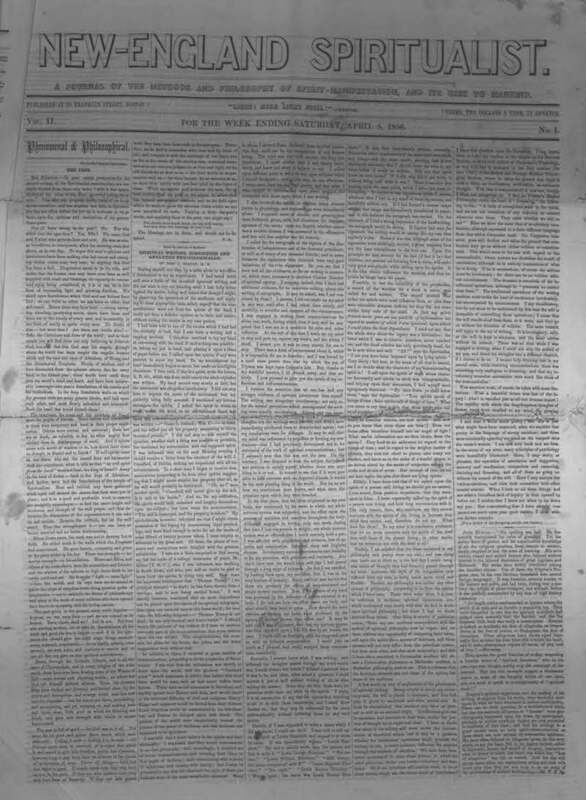 U. Clark's Spiritualist Register for 1858 claims for the journal a wide circulation, which was probably true, but it never succeeded in becoming a national forum for spiritualist debate, controversy and news, and failed in the hard economic times of 1857 and was merged into S.B. Brittan's Spiritual Age. On the transition, see Ex-Clericus, "Life with the Spirits," Religio-Philosophical Journal 4/17 (April 17, 1880): 2. Boston Public Library; NYPL; LOC.